(Press Release) The Alliance Française de la Dominique, in collaboration with the National Francophonie Commission, is organizing a tribute to pay homage to Aimé Césaire (June 26th 1913 – April 17th 2008) who was a Francophone and French poet, author and politician from Martinique. 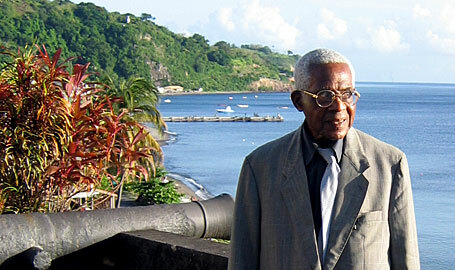 He was one of the founders of the Négritude Movement in Francophone diaspora. He wrote such works as Une Tempête, a response to Shakespeare’s play The Tempest, and Discours sur le colonialisme (Discourse on Colonialism), an essay describing the strife between the colonizers and the colonized. The event is scheduled for Friday April 27th at 6:00 PM. There will be a special appearance by his grandson Jean-Marc Césaire who will be conducting a presentation on the life and works of Aimé Césaire as well as a short film and exhibition. Members of the Press are therefore invited to document this momentous occasion.